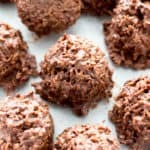 Gluten Free Double Chocolate Chip Oatmeal Cookies (V, GF): an easy recipe for soft, chewy double chocolate chip oatmeal cookies made with whole ingredients. Vegan, Gluten Free, Dairy Free, Whole Grain, Oat Flour. 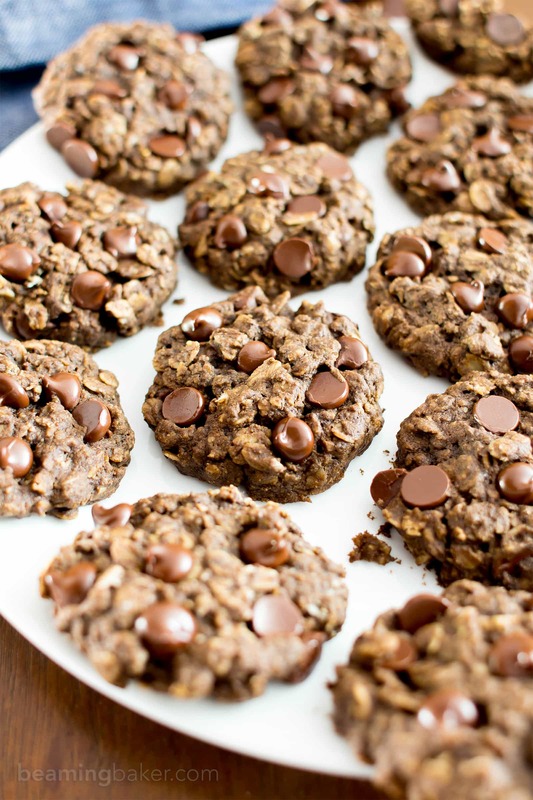 Please say it’s these Gluten Free Double Chocolate Chip Oatmeal Cookies. J/k! Obviously this recipe just came out, so it couldn’t be… or could it?!? Are you secretly the Flash? Did you already make these cookies before you even finished reading this sentence? Okay, I have to stop watching The Flash so much. To date, one of my favorite desserts of all time is cookies! 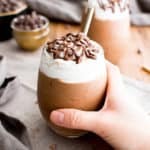 Okay, fine, I also absolutely love ice cream, dessert bars (with peanut butter, and without—no, really), super moist muffins, candy, and milkshakes. And honestly, there are a few more desserts I could list, but then we’d be here all day. Instead of settled on the cozy couch, eating fresh-baked cookies. 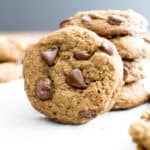 There’ve been peanut butter coconut cookies, inspirational trail mix cookies, peanut butter chocolate chip oatmeal cookies, double chocolate cookies, brownie cookies (because how can you really choose between cookies and brownies anyway? ), and even no bake peanut butter cookies. 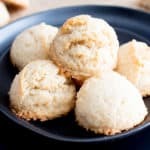 Have you tried any of these cookies? And which one was your fave? By far, my faves have been the oatmeal cookies—whether it’s the oatmeal raisin cookies or the oat flour chocolate chip cookies… or, oh you get what I mean. I really try to work oatmeal, oat flour, or oats into ALL of my cookies (which is totally gonna come to a halt for my next project: paleo cookies, of course). The thing is, cookies with oats in them just turn out… chewier, softer, tastier, and just more…enjoyable. 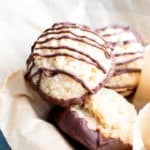 As such, I hope you’re with me when I say that it’s high time to upgrade a reader favorite: my gluten free vegan oatmeal chocolate chip cookies! As Erik says, “the only thing better than chocolate is double chocolate.” In this case, we might even have a bit more fun by simply saying the word “chocolate” twice. 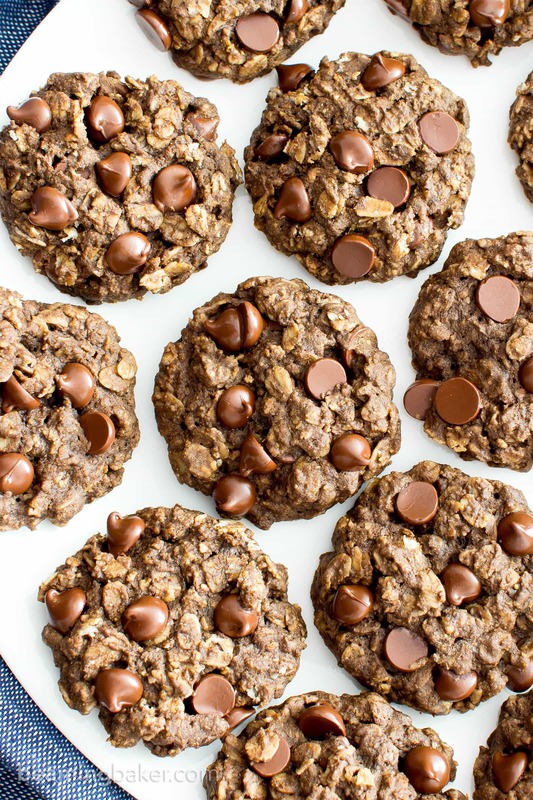 Who’s vote is for calling these cookies gluten free chocolate chocolate chip oatmeal cookies? a great excuse for making all the cookies! 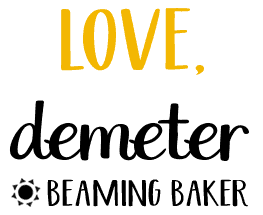 What cookie recipe are you hoping to see on Beaming Baker? 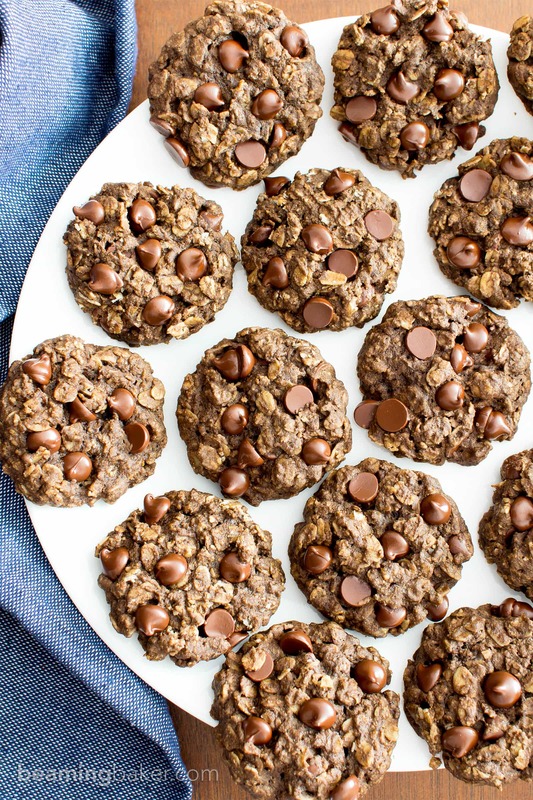 Gluten Free Double Chocolate Chip Oatmeal Cookies (V, GF): an easy recipe for soft, chewy double chocolate chip oatmeal cookies made with whole ingredients. Vegan, Gluten-Free, Dairy-Free, Whole Grain, Oat Flour. In a medium bowl, whisk together all the dry ingredients: oats, oat flour, cocoa powder, baking powder, baking soda and salt. Add the dry ingredients to the wet ingredients. Whisk until thoroughly combined. 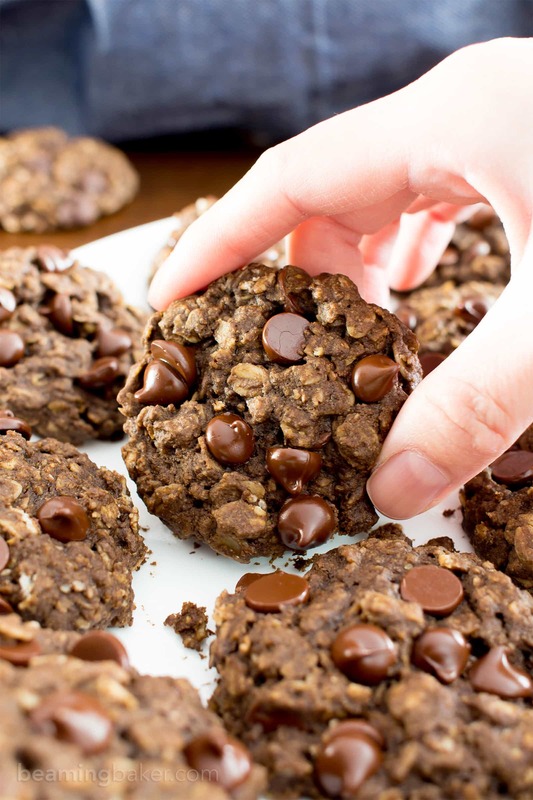 Fold in chocolate chips and oats. The dough will be sticky. 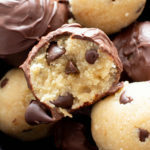 Using a [url target=”_blank” rel=”nofollow” href=”http://amzn.to/2tRInJ5″]2-tablespoon cookie scoop[/url], scoop balls of cookie dough onto the prepared baking sheet. Using a fork, flatten cookies into a round disc—they will not spread during baking. Optionally, press chocolate chips into the tops of the cookies. Bake for 8-12 minutes. Mine took 10 minutes. Using a flat, heatproof spatula, carefully lift cookies off the baking sheet and transfer to a cooling rack. If cookies are too soft to lift, allow to set on cookie sheet for 10 minutes, then transfer to a cooling rack. Allow to cool completely. Enjoy! Storing instructions below. – Adapted from my [url target=”_blank” href=”https://beamingbaker.com/gluten-free-vegan-oatmeal-chocolate-chip-cookies-v-gf-dairy-free/”]Oatmeal Chocolate Chip Cookies[/url] and my [url target=”_blank” href=”https://beamingbaker.com/maple-pecan-chocolate-chip-cookies-oat-flour-vegan-gluten-free-dairy-free/”]Maple Pecan Chocolate Chip Cookies[/url]. [br]- Store in an airtight container at room temperature for up to 1 week. [br]- Freezing instructions: store in an airtight, freezer-friendly container for up to 1-2 months. Allow to thaw at room temperature for 10-15 minutes before enjoying. Or, heat in the microwave in 15-second increments until warm. 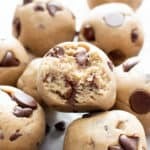 [br]- Nutrition Info: is an estimate based on 25 cookies and no optional topping chocolate chips used. 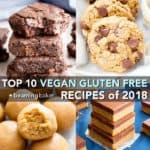 [br]- More cookie recipes (all V, GF, DF): [url target=”_blank” href=”https://beamingbaker.com/peanut-butter-coconut-oatmeal-cookies-vegan-gluten-free-dairy-free-whole-grain-happy-1-year/”]Peanut Butter Coconut Oatmeal Cookies[/url], [url target=”_blank” href=”https://beamingbaker.com/vegan-almond-butter-chocolate-chip-walnut-oat-cookies-gluten-free-oat-flour-dairy-free-vegan/”]Almond Butter Chocolate Chip Walnut Oat Cookies[/url], [url target=”_blank” href=”https://beamingbaker.com/gluten-free-trail-mix-cookies-vegan-gluten-free-dairy-free/”]Gluten Free Trail Mix Cookies[/url]. 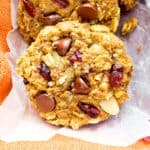 is there a way to make these lactation cookies? if i added 1/4 c brewers yeast and extra flax, would i need to alter anything else? Your cookies sound amazing! I totally agree about adding oats to cookies, it so often makes cookies so much better. I too love the texture! I’m excited to try these cause I’ve never used a flax egg before. I often add flax meal to smoothies, oatmeal, pancakes, muffins, etc. but I’ve always just added it as extra nutrition. Thanks for the recipe! Thanks Jennifer! 🙂 The texture of oat-upgraded cookies is the best! Can’t wait to hear what you think! I made these cookies today, mine were wet, and I added the additional oats, but I flatten them and baked them, I got flattened cookies and mostly run together as one. So they flattened and spread. Was your coconut oil hard? Mine was melted, not on purpose, but I live in a desert, so I get liquid coconut oil in my cupboard. The cookies are still delicious, but not right, didn’t look like your at all. Hi Sherry, so sorry to hear about this! This dough is actually pretty sticky and fairly thick. My coconut oil was melted and completely liquified. It almost sounds like there wasn’t a binding agent. How did you prepare your flax eggs? Also, do you usually have to modify baking recipes at all? Weird, mine was very soft and didn’t “stick” together at all, so wasn’t surprised when I got almost one large cookie melted flat. No, I don’t usually have to modify a recipe, I live in California, where it’s in the 100’s right now, I’m in the dessert, not high altitudes or anything. With temps what they are no surprise I have liquid coconut oil, but you used liquid too. And I took my oats and put them in my food processor to get the oat flour, and used the extra oats under “add in” so doesn’t make sense. 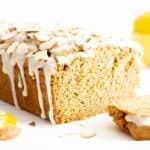 Flax eggs, now this is new since using some of your recipes, and no previous problems with recipes, all have turned out great! I have ground flax meal in my refrigerator, and mixed it with the 6T water and set it aside as you said for 15 min. But I never get a gel like substance, which is what I’ve expected, but new to flax eggs, not sure what I should be getting. I expect it to be like soaked chia seeds, but it never does anything but look like wet flax meal. Maybe my flax meal is old? Hi Sherry, yeah, you’re definitely not supposed get that one large melted cookie. 🙁 I think that your flax is the issue. It definitely should gel up (turn pretty gooey). After 10-15 minutes of setting, the consistency should change quite a bit. It might be time to purchase a new bag. I also recommend getting finely ground flax–it gels up much better than coarsely ground flax. Good luck! P.S. Oats: did you measure them after you ground them into flour or before? Yeah, I always compare mine to the photos and usually your recipes have been consistently delicious and right on, so when I saw this melted mess I said “what happened?”. I have my flax in a container in my refrigerator, and had part of a bag in there too, so looked at the expiration, and it’s not close, but did not check to see if it was finely ground or coarsely ground. I can always run it through my blender and then give it another try. But I didn’t get the consistency you reference the first time around. And I did measure the oats after I ground them. I will give the recipe another try because they did all get eaten! Even though I had to break them apart and they were rather chewy. Tells you how good they were! I just made this recipe for the first time. Wonderful cookie flavors, texture is great. I had a problem with flattening the cookies due to being so sticky. I tried 3 different ways then gave up. My second pan went into the oven unflattened (and came out unflattened LOL). Still great cookies, though round like some of us 🙂 I will be making these more, but won’t be flattening. Hey! I just made the cookies and they turned out wonderful! I was just wondering if you know how many calories, carbs, protein, and fat the entire recipe holds? Awesome! I’m so happy that you enjoyed them, Harnoor. 🙂 I just finished calculating the nutrition info. Everything you’re looking for is listed below the Notes section of the recipe. Hi Demeter! I just made this recipe (I only wanted 10 so I did half of the portions). I also used real eggs instead of flax. They taste good but the texture is not like any oatmeal cookies I’ve ever had! It’s almost like a chocolate cake in the shape of a cookie. I really wonder why? English is not my first language so maybe I did not understood what “fold in the oats and chips” meant? I just added them to the mix. Wondering if you know why the texture is weird? Thank you for your answer! It helps a lot 🙂 I want to try again because I really liked the taste! I made these tonight, and they were wonderful, thank you for the recipe! I used chia eggs if anyone is wondering if that would work, and they turned out great. For the friend above that had trouble getting the flax egg to tel, I put mine in the microwave after mixing the flaxseed with water for about 30 seconds. It gets very slimy, just what we want, after sitting for 15 minutes. So happy you enjoyed them, Jaye! 🙂 Thanks for adding your tip on getting the flax to gel. Happy baking! Hi Nicole! Yep, just make sure to thaw them. 🙂 Enjoy!